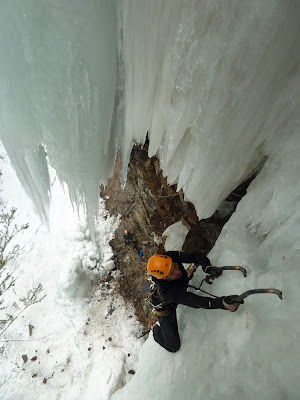 Winter is loosening it's icy grip on the Catskills but conditions over this past week have been surprisingly good. Sunny things are looking a bit baked and this weekend's forecasted rain may do some damage but I think we have at least one more good week left. All winter I've been working with Chris Beauchamp establishing lines on the upper cliff in the Hellhole. Recently though, I've been busy with other things. Life happens I guess. Chris has kept at it though, shooting photos and cleaning new lines. We did his new one this week. He was gracious enough to let me have first go at the route on Wednesday. Two straight days of rest left me feeling pretty good and it was nice to walk right up and send first go. I guess climbing lots overhung mixed routes does make you fit (it's seems like a pretty specific type of fitness though). This new line is call Erosion Control and finds a way to break the lower steep section in order to climb the large corner system that dominates the center of the cliff. 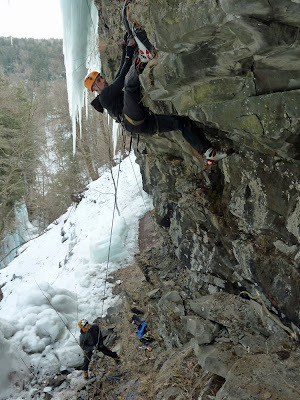 The steep start (your body is horizontal and heel/toe hooking is mandatory) leads to secure climbing up the overhung lower wall. The rest is a romp to the icicle up the right trending ramp.